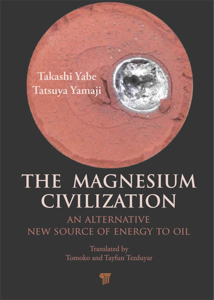 On December, Pan Stanford Publishing will publish “The Magnesium Civilization” (English Edition). The use of fossil fuels damages the global environment, and the supply of oil is becoming unstable. However, it is difficult to fully replace fossil fuels with renewable energy sources like solar cells. A magnesium-recycling society is a promising solution against these problems. Seawater contains 1800 trillion tons of magnesium, which can be smelted with “solar-pumped lasers” created directly from sunlight. Thus magnesium acts as a solar-energy reservoir. It can be used for metal-air-fuel cells for automobiles and power plants. An automobile with a zinc-air-fuel cell achieved a mileage of 600 km in 2003, and a magnesium-air-fuel cell can give 3 times more energy which is 7.5 times more effective than that of a lithium-ion battery. Solar-pumped laser regenerates metal magnesium from combusted magnesium oxide. Moreover, low-cost desalination with solar power will be a promising solution to the global water shortage.